"Whenever in doubt, go back to the roots"- They say. You know what, the journey called life might have drifted you far away from the origin, but then with the slight waft of resurgence, you tend to retrace and revisit those salad days. Honestly speaking, people might put forward counter arguments when I say that over the years, our tradition, ethics and customs have retained the inner integrity; but then one thing is for sure...when it comes to Bongs and their folklore, there's an underlying fidelity for sure. I've been interacting with a number of Bongs who have settled abroad (termed as "Probashi Bangali") and believe me, their respect and enthusiasm in this very respect is remarkable. People often tend to draw a close synergy between the Bongs and their earnestness towards festivities; let's be honest with this, it is indeed our treasured endowment...every aspect of a Bong fiesta has it's idiosyncratic charm. And since I brought in the reference of "charm", let's quickly shift focus and talk about the tantalizing aspect of "charm on the platter"...ah I knew it. I could sense the glow in "your" eyes and the virtual lip-smacks as we dig deep into this intrinsic aspect of festivities errm "food" for thought. Moi: "Hey whassup? Long time no see. What plans for Poila Baisakh?" Le Friend: "Hola. Yaar, nothing much. I miss my life back in Calcutta....Nobo-borsho was so much fun." Moi: "Yeah...I reckon no haal-khata ceremony(books of accounts) and stuff back in Delhi? Miss our competitive rivalry with the number of calendars and 'sweet packets' collected on this day. So much fun yaa." Le Friend: "For sure. And remember, those mouth-watering snacking options that were on offer at these stores. Not to forget, these packets contained quality sweets from renowned sweet-meat stores of the city....especially the ones that were 'procured' from the jewelry stores in our neighborhood. This was pretty much synonymous to the coveted Pujo Parikrama during Durga Puja; we would rather term it as Halkhata Parikrama. Haha." I could pretty much sense the chomp of nostalgia, the conversation was engaging enough. Moi: "Oh my, that was just about half the story my friend. Remember what used to wait for us back in hut? I'm like feeling so nostalgic at this moment." Le Friend: "Haha, glad you mentioned. Aunty used to cook some amazing food back at home, such a rich spread...rather an absolutely rich and enticing Bengali spread. Do you remember the names of all those delightful dishes? Sigh, we don't get such food here in Delhi. And the lovely family get-togethers that used to happen on this day...such adda, fun and pranks; sigh...I'm so missing all this being away from Calcutta." That last bit had poignancy written all over it. I didn't want to aggrandize her misery but then she had pretty much shoved into a luring flow. Moi: "Okay, since you brought up this topic....let me me do this. That's our Poila Baisakh menu for today. Jealous much? Hey wait...did you just say Enchor chingri?" Moi: "Err, yes I did. Don't you remember that last time you dined with us...."- I was halted mid-way through the sentence...I could sense the growing jitters on the other end of the call. Le Friend: "Dude, JUST GET ME THE RECIPE like RIGHT NOW. Listen, I never disclosed your secrets in front of your mom; this is your turn to return the favor. Please, please.....!" Moi (Err...okay, yes she did. She never disclosed those bits and pieces of classified information, ahem, in front of my parents and I reckon I could do this much): "Okay relax. Lemme ask mom and will email you the recipe in 30 mins time. And err....Subho Noboborsho!" Le Friend: "Thank youuuuuu. Subho Noboborsho to you and 'pornaam' to kakima as well....will wait for the mail. Byeee!" And she hung up in a jiffy. Well, I did comply, here's the content of my email. Procedure: At the very onset, cut the enchor (jackfruit), potatoes and tomatoes into diced pieces, then rinse well in water. Thereafter, apply some salt and turmeric powder in the enchor and cook it in a pressure cooker, applying around 1 or 2 "steams". In the meanwhile, mix salt and turmeric with the prawns (please ensure that the prawns are washed and cleaned properly before cooking) and fry them till they become soft and generate a light orange colour. Set them aside and fry the potatoes till they soften. Furthermore, add adequate amount of mustard oil in a deep bottom pan, heat and then start frying the onion paste at a low flame. In the mean-time, slowly add ginger, garlic paste, red chilli powder, sugar for giving colour to the recipe; the diced tomato needs to be added next. Continue frying in a low flame till it starts separating from the oil; then add the jackfruit, fried potatoes, prawns and salt to taste. By the way, the key here is to mix the masala well with the enchor and chingri in bengali (termed as "koshano" in Bengali) to extract the best flavor out of the entire mix. Once this is done, add around 3-4 tablespoons of water as the penultimate step. Once this is done, you need to add some ghee to add to the delectable fragrance, put off the flame and cover it. You need to serve it "hot" to the guests so that they can indulge in the luscious charm of this essentially Bengali delight. 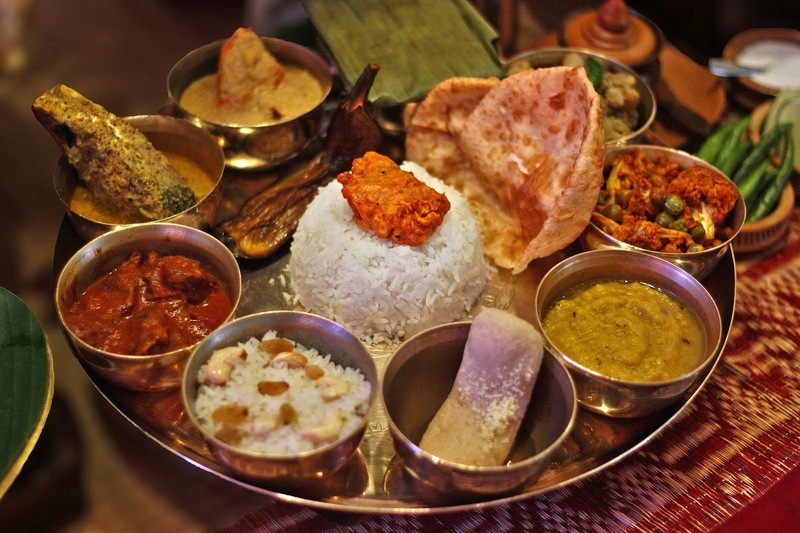 The assorted authentic Bengali thali, looks delectable isn't it?